Consumption is now vaunted as the panacea to the Global Financial Crisis. This is a sick solution and a knee jerk reaction by economists who do not see the big picture. Hopefully statesmen will see that quickly consuming what you have leaves you with nothing. Like the provisions in a life boat, because (economist do not know this but intelligent people should) the globe we live on is a life boat. Dont economists/policy advisors get it? We are on a totally isolated, finite, spaceship hurtling and spinning through the vacuum of space. In terms of material resources, my gain is your loss. We cannot blame those clever people of two centuries ago who drove policy with a boundless New World vision. But in 1966 our entire global living space was captured in a camera lens frame from an Apollo rocket and now we can no longer be small minded about our sustainability. Let us rethink where we are at. The epitome of a consumer is Pakman, the little bean eater in one of the first computer games appearing as a screen on a table in corner stores in the US in the sixties. Pakman was just a caricature – a circle with a triangular mouth whose aim was to gobble whatever was in front of him. The more the better. The ultimate consumer. 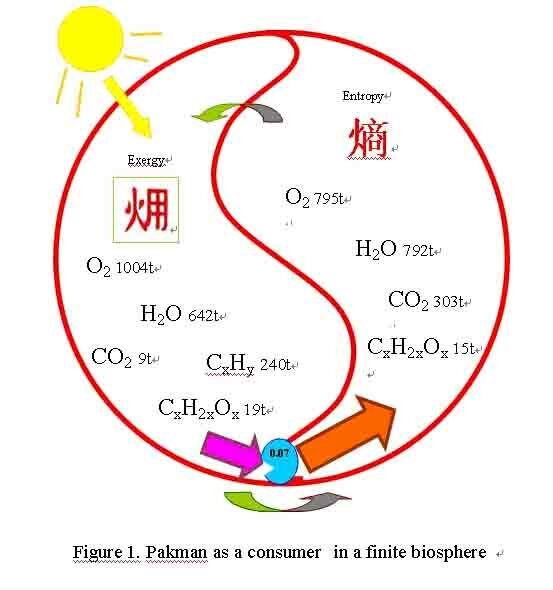 There is just one issue with this scenario, now comes to the fore: No matter what is out in front for the free taking, the faster the better, Pakman consumes but has no emissions – solid, liquid or gas. If policymakers are advocating consumption as the solution to today’s problem, tomorrow’s resources will not be free. But there is a far more serious yet under-addressed problem of what to do with waste. The throughput, equal in mass defined by number of atoms, comes out the backside. Policymakers need to be responsible for where waste goes. A Pakman world is a daunting science model. You and me, as represented by Pakman, occupy a mere 0.07 cubic meters of space. As primitives, on average we inhale air at 1.5 liters/second, drink 3 liters water and eat half a kilogram of grain a day. Without O2, we die in a few minutes, without H2O we die in a few days, and without carbohydrate (CxH2xOx) we cannot live long either. But for a primitive person, the world seems boundless. Even though not one atom of oxygen, hydrogen or carbon is created anew, or destroyed, the natural cycles of carbon and rain, driven by incoming photons from the sun, replenish resources needed. The small amount of waste is recycled by nature, and even some used water and excreta recycled by conscious design. Industrial Pakman is another matter. Apart from basic human needs, the processes driving GDP divided by global population of 6.7 billion results is unsustainable consumption and horrific throughput of waste solids, liquids and gases. Industrial Pakman operates on an average surface that is 80 meters wide and 280 meters long, and fortunately Pakman has another resource which is a vital natural temperature and air conditioning service – the sea, and for each of 6.7 billion of us, that averages 280 meters long and 200 meters wide (and 3,500 meters deep). Each Pakman has an airspace of 760 million cubic meters, which seems so enormous we do not need to appreciate the fact. It is hard for us to imagine the scale, but as we enter the year 2010, a realistic inventory of resources and the ecological services brings a new view – a view that should hasten policy makers to look for new technologies, even new paradigms, and certainly not listen to relic economists advising extrapolation of growth by accelerated blind consumption. Table 1 lists the most basic resources we need and estimates the amount in tonnes an individual consumes and emits during a 70 year lifetime. It is important to admit, though economists never dream of this, that in material terms, physical consumption balances with aggregate waste. A confusing factor in attempting to comprehend the seriousness of the problem is that historically the substances were not understood as chemical compounds, or in the case of oxygen and pollutant emissions, not even appreciated at all. Founding economist, David Ricardo, in his 1817 defining tome on resources, pronounced water as “free” because of its abundance. Even now, governments have trouble valuing water, when sometimes it is pure falling rain or flowing mountain streams, sometimes as disastrous muddy floods, and after farms, factories and households have run it through their systems, often as pollutant. The saying, until two decades ago in the West, “Gone up in smoke,” meant for something to disappear and be of no account. Now some governments are willing to value that smoke (as carbon dioxide) at $20/tonne, and entrepreneurs are saying they will buy it for storage or some form of safe disposal at $70/tonne. Trying to aggregate land, sea and air as the three basic phases in physics – solid, liquid and gas in either tonnes or cubic meters is a dilemma that markets try to solve by fixing prices at the intersection of demand and supply curves in whatever units of measure. This is the best working system we now have, and governments attempt to regulate economic activities by shadow pricing public resources like water and common land, and attempting to penalize polluters. But let not the science daunt us. A puny 1.65 meter (average) Pakman is an actor. almost a bystanding interloper, not a master of his biosphere, though now with capability to make a mess of it. If all the carbon dioxide a person produced in a lifetime (global 29 billion tonnes/population 6.7 billion people x 70 years) the 302 tonnes, if it were solid dry ice, would be a cube of sides about 7 meters. We could bury in some desert. But the emission is a gas, dispersing now to make up 383 parts per million of the volume of the air. That is not poisonous, and it is invisible. The scientists promoting Green House theory are bold enough to predict that the increased entrapment of photons will raise global average temperature by a few degrees, and at the Copenhagen Climate Change Conference one small island representative said he had cried when a ceiling of 1.5 degrees Celsius increase was dismissed for wording that capped at 2 degrees. I do not think we can engineer the weather that finely. But when Pakman gobbles 1900 tonnes of matter and then expels it as waste, that adds up to polluting the environment seriously, and we cannot foretell the consequences. In 1971 Havard University Press published a book of momentous importance. The Entropy Law and the Economic Process. The author, Nicholas Georgescu-Roegen, was an economist of decades of respectable contributions to his discipline. What he advocated was iconoclastic and revolutionary: He criticized 2 centuries of economics as founded on Newtonian mechanical models – a perpetual motion machine of magical clockwork that was impossible, even in theory. Economic processes are unidirectional flows: breathing, refining iron ore into iron, making cars… The phenomenon of entropy, discovered in 1824 by Carnot studying steam engines, and refined in 1876 by Gibbs to include all chemical processes is at work. Encapsuled in the Second Law of Thermodynamics, entropy always increases. Fortunately for us, in finite material environment, the sun is an outside source which can replenish energy, and sustain our life giving flows. Georgescu-Roegen’s book took the seventies by storm, coming at a time of environmental awakening (publishing of Silent Spring, Limits of Growth, and the oil crises) and he was feted around continents. A follow-up explaining volume by activist Jeremy Rifkin had a foreword by Al Gore. But then the impetus died. Four reasons. Firstly, entropy is a difficult concept even for students of thermodynamics and chemists who have to use it as an application is solving some problems. The building blocks of its science will need to be taken down and restructured, probably needing quantum mechanics, to be of wider use. Certainly its science was beyond the ken of an old economist like Georgescu-Roegen. Secondly, as intuitively exciting as it was, it had no fit in the fields of information theory, art and the pseudosciences where it was usurped. Thirdly, the economist chant of “Markets will adjust” is true in the long run, and without entropy science, consumers eventually find out how expensive energy inefficiency and polluting can be, and production processes are adjusted, even if it takes ten years. Finally, entropy was bad news for business and politics. Jimmy Carter lost to Ronald Regan in 1980 preaching humility of economic processes. The bible of economics, titled simply Economics, by Paul Samuelson carried a page on entropy economics in the 1980 eleventh edition, then dropped it up till now in the current Nineteenth edition. But the old iconoclast was right. Old economics based on old science needs to be revamped on new science. Consider this. The First Law of Thermodynamics sets out that matter and energy cannot be created and destroyed. So to talk of producing and consuming energy is unscientific. Joule introduced the concept of energy and it actually conceals what goes on when chemical electromagnetic forces (in fuel) are converted to heat/work. The scientific approach is to track exergy conversion to entropy. On our Earth, for Pakman, not one atom of anything is created or destroyed (except in nuclear industry). We do not produce one atom of carbon, iron, or oxygen. They are all parts of magnificent (dare I say supernatural) cycles. So Pakman is in his confined sphere, gobbling goods and excreting bads. In exactly equal tonnages. That is the model we need from now on. Entropy always increases, and only the inputs from the sun, at a fixed rate, can replenish the cycle. Of course our throughput of carbon far exceeds the photosynthesis that refixes carbon, and is a problem we need to sensible address. Figure 1 is a start for this approach.